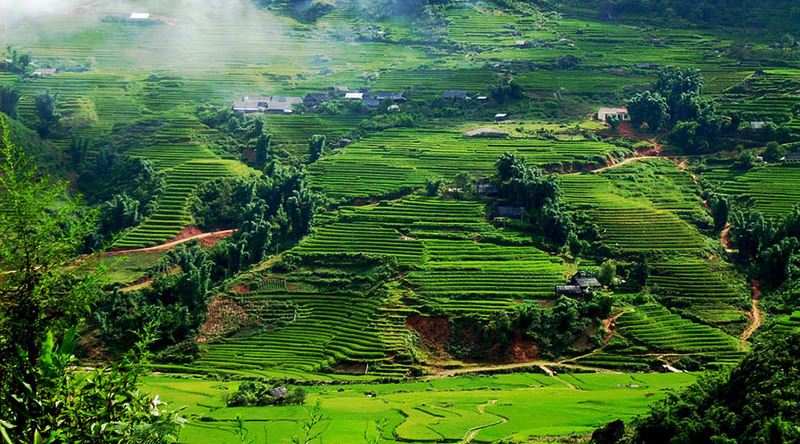 Moc Chau is famous to everyone as the land of tea. By coming here you will have special experiences of joining tea producing steps such as picking tea leaves, drying tea in a pan,…and then, you can enjoy the unique feelings of “bathe in tea”, “bathe in fresh milk” services which is very good for our health. Come with us, Moc Chau Arena Village will give you unforgettable experiences. 14.30: The tour guide will take you to visit some famous places at Moc Chau such as: the garden of orchids – the specific flower of forests in the North-West, enjoy the charming beauty of precious orchids… You can visit the Dai Yem Waterfall, listen to a legend about a beautiful girl using her blouse to rescue a boy from flood water. The next attraction is the Pine Forest of Ang Village, a dreamlike place with immense green colour of pines by a big beautiful lake. Besides, you will enjoy the glamour of the beautiful rolling hills of wild flowers, gardens of plump-trees, peach-trees…and you can visit a family of Ethnic people on the way to discover their traditional customs. 18.00: Have dinner with specialties of the North-West. After dinner, you can join in an important process to make good tea product, that is callled “dry tea in the pan by hand”. After that, you enjoy a hot tea that has just made by your own hands. 7.00 – 7.30: Have a breakfast. 8.00: You’ll visit Ngu Dong Ban On – fives cave systems associated with the theory of five elements: Metal, Wood, Water, Fire and Earth. Inside the cave there are many beautiful stalactites, impressive crystallized over thousands of years created many impressive shape. Along the way, visitors can enjoy the spectacular natural landscape of northwestern mountains with ancient trees, many trees and flowers along the roadside weeds. 11.30: Back to Arena Village for luch. Afternoon: You can enjoy free bike admire the beauty of the plateau or leisure, green tea picking experience at Arena Village. Evening: Have dinner and overnight at the Arena. 11.30: Back to Moc Chau Arena, check out the room. 13.30: Take you back to Hanoi.